Military Army Style Tactical Combat Assault Backpack. Condition is New with tags. Adjustable chest, waist and shoulder straps. Removable internal plastic stiffener with center stay for support. Top carry handle. Top hydration tube exit point. 7 main zippered outer compartments. Multiple internal pockets. Side lashing straps. Four outer side zipper pockets. 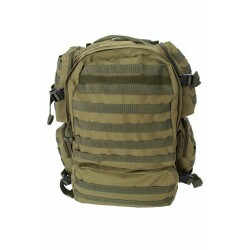 Main internal cargo area has two zippered mesh pockets and lashing straps. The waist pad, shoulders straps and back area are padded. Approximate size loaded 20" H x 18" W x 13" Deep. Approximate empty weight 5.4 lbs. Color choices are Black, Tan (Coyote Brown), ACU Digital Camo and Woodland Digital Camo. Brand is Hanks Surplus. Made from heavy duty polyester material.